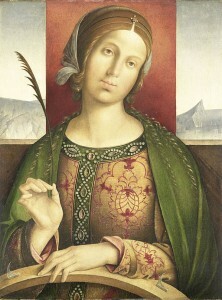 Bridget was the daughter of a wealthy governor who used his riches generously. He donated money for good causes and helped the poor. He worked for the just and fair treatment of all the people. Bridget, who was born in 1303, learned these lessons early in her life. Bridget married into the Swedish royal family and lovingly raised eight children, one of whom came to be known as St. Catherine of Sweden. Bridget and her husband followed her father’s example of caring for people in need. It is said that she even arranged for a hospital to be built on their estate. The hospital was open to all. When her husband died, Bridget gave away all her possessions. She founded a double monastery for men and women who lived apart, but worshipped together. The religious order was known as the Order of the Most Holy Saviour, or the Brigittines. Bridget died after she returned to Rome, but her body was eventually returned to her land and the people she loved and cared for. Her coffin was carried reverently through Europe to Sweden, and she is buried at the monastery she founded. 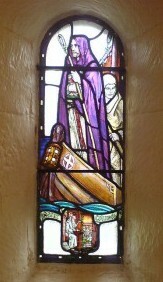 Because of her holiness, Bridget was declared a saint only 18 years after her death in 1373. She is the patron saint of Sweden. In 1999, Pope John Paul II honored her once more: St. Bridget was named co-patron saint of all of Europe along with St. Catherine of Siena and St. Teresa Benedicta of the Cross, who was known as Edith Stein in life. 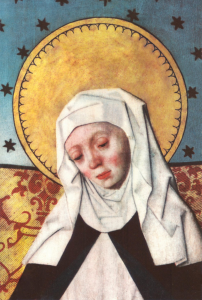 We honor St. Bridget, also known as St. Birgitta, on July 23 each year. We can pray to Bridget, asking her to help us to love and care for our neighbor as she did.